Additional research provided by Barry McGee. The Branch Banking and Trust Company was established in Wilson in 1872, when Alpheus Branch and Thomas Jefferson Hadley formed Branch and Hadley, a private banking firm. In 1887 Branch bought Hadley's interest in the company for $81,000, which is believed to have been the largest check written in Wilson County up to that time. The company's name was changed to Branch and Company Bankers, then to Wilson Banking and Trust Company (1889), the State Bank of Wilson (1891), and finally Branch Banking Company (1893). Branch Banking operated as a private institution until 1900, when it began operating under a charter. In 1907 it became the first bank in the state to engage in trust activities, and in 1913 its charter was amended to change the company's name to Branch Banking and Trust Company (BB&T). BB&T was the only bank in Wilson to survive the Great Depression. The tenure of BB&T president Herbert Dalton Bateman (1924-52) saw, among other accomplishments, the establishment of 17 branch offices throughout the state. Dramatic growth, through mergers, acquisitions, and interstate banking, took place from the 1960s into the 1990s, and by 1994 BB&T was the state's fourth-largest bank. 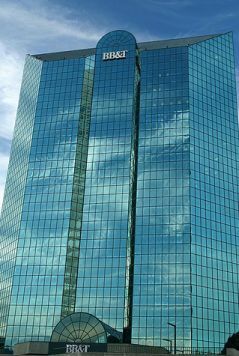 BB&T's 1995 "merger of equals" with Southern National Bank, based in Winston-Salem and at the time the state's fifth-largest bank, marked the beginning of the modern BB&T Corporation. Southern National had its origins in the Bank of Lumberton, founded in 1897 by Angus Wilton McLean. The acquisition of neighboring banks and expansion of branches caused the bank to change its name several times, culminating in 1963 with the name of Southern National Bank of North Carolina. By 1965 the bank had 22 offices in 13 eastern North Carolina communities, and it had moved into other business lines, such as credit cards, mortgages, and leases. Southern National's headquarters moved to Winston-Salem in 1993, although corporate headquarters and several other divisions remained in Lumberton. After the Southern National merger, BB&T Corporation had 437 branches in 220 locations in the Carolinas and Virginia. Other acquisitions, including Maryland Federal Bancorp (1998), First Citizens Corporation (Georgia, 1999), Matewan Bancshares (West Virginia, 1999), BankFirst Corporation (Tennessee, 2000), FirstSpartan Financial Corporation (South Carolina, 2001), and MidAmerica Bancorp (Kentucky, 2002), signaled the company's continued growth outside of North Carolina. By 2006 BB&T Corporation employed more than 28,000 people, had $110 billion in assets, and operated more than 1,400 branches in 11 states and Washington, D.C.
Vidette Bass, BB&T: A Tradition with a Future (1992). Clint Johnson, Service-None Better: The History of Southern National Bank (1997). Hugh T. Lefler, ed., North Carolina History Told by Contemporaries (4th ed., 1965). Search results from the North Carolina Digital Collections search results for Wilson Banking and Trust company, including the 1989 Bill to incorporate the company, and a recommendation for it not to pass. BB&T Tower, downtown Winston-Salem, 2006. Image courtesy of Brian Leon. Available from http://www.flickr.com/photos/ncbrian/302742147/ (accessed July 5, 2012).